As our last piece of the New Year’s series (don’t miss part 1, part 2, part 3 and part 4) we wanted to tell you about two of the most popular and widely known traditions of the Japanese New Year – Shishimai, the Lion Dance, and Daruma. 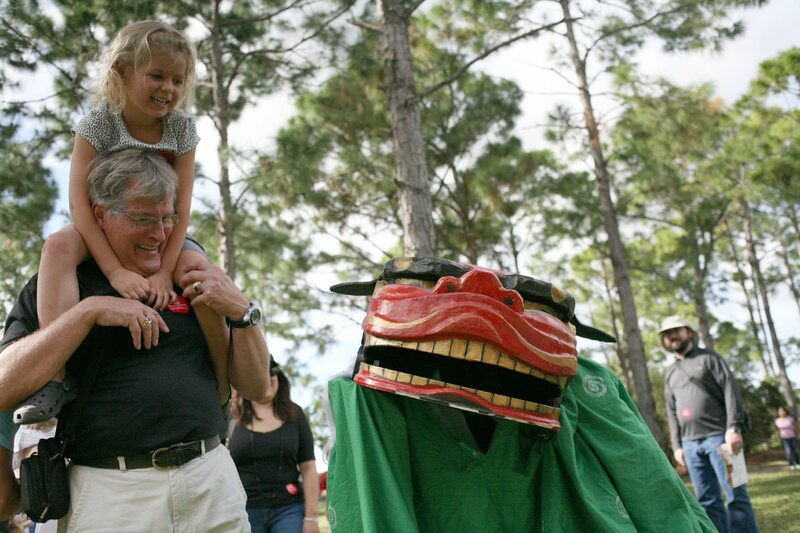 These two are among the most recognizable elements of the Japanese New Year and our annual celebration: Oshogatsu. Shishimai is the traditional Lion Dance performed during New Year’s celebrations all over Japan. The tradition originated in China, but has spread throughout Japan as a New Year’s staple as well as a popular dance at Shinto Shrines during other celebrations. The lion costume is made of a wood and lacquer head called a shishi-gashira which literally means lion head, and the body is made of green dyed cloth with white designs. The lion can be manipulated by a single person, or two people, and as with Chinese lions, the make of the head and designs on the body will differ from region to region. In Okinawa, a similar dance exists, though the lion there is quite different than the shishi of mainland Japan. Instead of dancing to the sounds of flutes and taiko drums (like he does at Oshogatsu), the Okinawan shisa dance is often performed to folk songs played with the sanshin. Daruma is also a very important and recognizable figure for the New Year. The original Daruma, also called Bodhidharma, was a Buddhist monk who lived during the 5th/6th century CE. He is traditionally regarded as its first Chinese patriarch and the father of Zen Buddhism. Later, monks began designing dolls as symbols of Daruma, and these dolls are now regarded as a symbol of good luck, especially for the new year. It’s common to give a Daruma doll as a gift, then the giftee colors in one eye of the doll and makes a wish or sets a goal. Once the wish or goal is complete Daruma’s other eye can be colored in. In this way, every time the recipient sees the one-eyed Daruma, he/she recalls the goal. It’s sometimes said that Daruma-san is motivated to grant your wish, because you promise to give him full sight once the goal is accomplished. At Oshogatsu you can take part in this tradition too! At our DIY Daruma wall you can write a wish or goal, and color in one of Daruma’s eyes. Then you can come back next year and give him full sight if your wish or goal comes true. We’ll also have last year’s Daruma Wall up for you to check in on your 2013 wishes and goals. We hope to see you all at Oshogatsu this Sunday – and remember: discounted tickets are on sale ONLY until Saturday at noon, after that tickets will be $10 for kids and $15 for adults at the gate. Happy New Year, and have a wonderful Year of the Horse!